Bad news for Microsoft: After the free upgrade-offer is gone, the market share of Windows 10 is no longer increasing. This is revealed by the newest usage-share numbers from Statcounter and NetMarketshare. Microsoft had an ambitious goal for Windows 10: Have 1 billion active Windows 10 machines until 2018. However, this goal was already given up on. 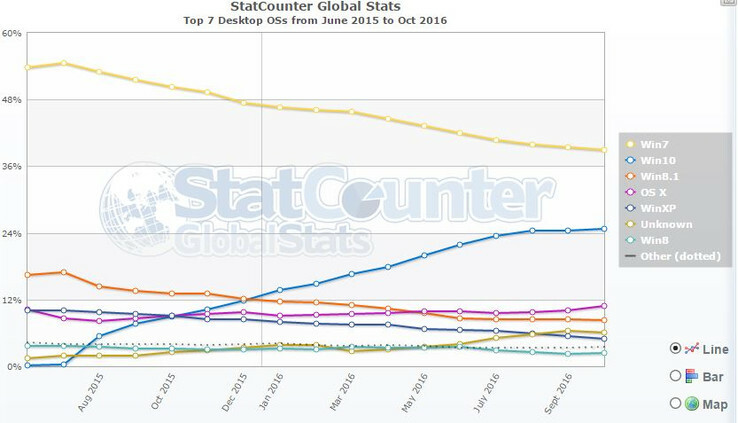 Now, there are more bad news for the company: The market share of Windows 10 is not increasing. On the contrary, it has been stagnating in the last few months. This is confirmed by Statcounter as well as NetMarktshare. The alleged reason: The free upgrade offer for Windows 10, which ended on July 29. The offer must have had a bigger effect on the Windows 10 adoption than some would have anticipated. Until July, Windows grew around 2 % per month. At the end of July, the system was installed on 23,53 % of all PCs, according to Statcounter. In August, this number went up to 24,4 %, but since then it moved up by 0,4 %. If you look at NetMarketshares numbers, its looking even worse: There, the Windows 10 usage-share went down 0,4 % from August till October. Now, Microsoft likely has to put all its hope into a successful holiday-season business. The market share could only grow significantly if many new PCs are sold. Also, Microsoft might hope that more and more enterprise-customers will adopt Windows 10. The enterprise currently still is a major stronghold for Windows 7.